Size distortions by Anonymous - This image serves as an accurate portrayal of the commonly experienced effect known as perspective distortions. A perspective distortion is defined as a subtle to extreme change in how a person perceives the size and distance attributed their body, to specific parts of the external environment, or to the external environment as a whole. This effect is capable of manifesting itself in 4 different ways which may reflect the failure of each respective responsible visual function. Macropsia - Objects are perceived larger than their actual size. Micropsia - Objects are perceived smaller than their actual size. Pelopsia - Objects are perceived nearer than they actually are. Teleopsia - Objects are perceived much further away than they actually are. When affecting distance, perspective distortions can make things seem as if they are physically closer or further away than they usually would be. This can range from a subtle experience, such as the other side of the room feeling marginally further away than it usually would be, to an extreme experience, such as feeling as if the horizon is right in front of you. When affecting size, perspective distortions can make things seem as if they are physically smaller or larger in terms of the sense of size that one would usually attribute to them. This can range from a subtle experience, such as the room feeling marginally smaller and more cramped than it usually would be, to an extreme experience, such as feeling as if the room is hundreds of miles wide. Perspective distortions are often accompanied by other coinciding effects such as depth perception distortions and visual disconnection. They are most commonly induced under the influence of moderate dosages of dissociative compounds, such as ketamine, PCP, MXE, and DXM. 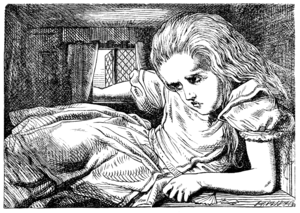 Alice by Lewis Caroll - This illustration depicts a scene from Alice in Wonderland in which she has grown in size. It is an accurate representation of how it often feels to experience this effect. Feelings of suddenly having an impossibly giant or tiny body are also a very common manifestation of this effect. This feeling is already known by the scientific literature as “Alice in Wonderland Syndrome”, where it is seen as a temporary condition often associated with migraines, brain tumours, and the use of psychoactive drugs. The effect can either be attributed to the body as a whole or specific parts of it. For example, feelings of having a huge head or tiny limbs are possible. ↑ Schneck, Jerome M. (1965). "MACROPSIA". American Journal of Psychiatry. 121 (11): 1123–1124. doi:10.1176/ajp.121.11.1123. ISSN 0002-953X. ↑ Horowitz, Mardi J. (1969). "Flashbacks: Recurrent Intrusive Images After the Use of LSD". American Journal of Psychiatry. 126 (4): 565–569. doi:10.1176/ajp.126.4.565. ISSN 0002-953X. ↑ Blom, Jan Dirk (2016). "Alice in Wonderland syndrome". Neurology: Clinical Practice. 6 (3): 259–270. doi:10.1212/CPJ.0000000000000251. ISSN 2163-0402. This page was last modified on 19 January 2019, at 09:43.